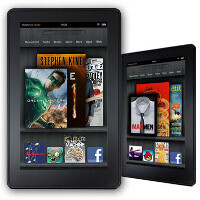 The Amazon Kindle Fire showed impressive growth in the first weeks of its availability with impressions on Millenial’s US ad network growing by the whopping 19% on average daily. At such a rate, the Fire outpaces the iPad’s growth, but even with such tremendous popularity of Amazon’s Android-based tablet, Google’s platform recorded one of its biggest slides going down to around 50%. iOS and, surprisingly, RIM’s BlackBerry platforms both grew in return in November. Android however is still an undisputed leader capturing half of the market, followed by iOS with a healthy 30% and BlackBerry with 17%. Together, the three platforms occupy 97% of all the impressions on Millenial’s ad network. On the manufacturer side of things, Apple reined supreme with a 25.7% piece of the pie. The biggest loser there was HTC with its share tumbling to only 12.6%, down from 18.1% in October. 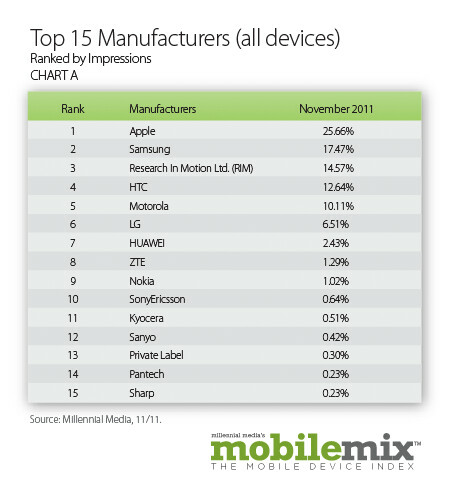 Runners-up to Apple were Samsung with 17.5% and RIM with 14.6%. now tell me, how would you beat an OS that is being produced by tons of different manufacturers? Android is King. Symbian used to be that way. 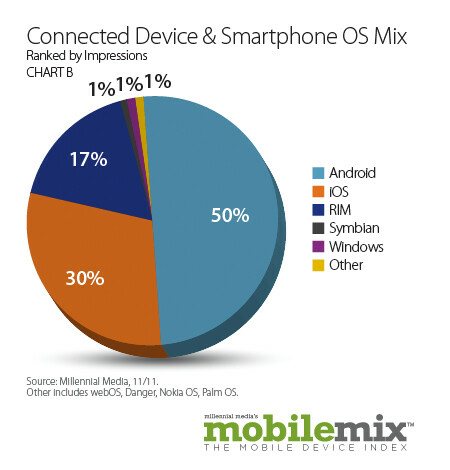 Besides Symbian, you could have said the same about Windows mobile OS. look at chart B. where is SGS II ? its the same thing i biztch about every time. EVERY iphone model and version is lumped under "iphone", yet all the SGS phones and android phones are broken up. The vibrant, sgs, fascinate are all the same phone on different carriers. This chart has been crap with every release, and it will continue to be crap until they fix that by either lumping ALL similar phones together like they need to do with the galaxyS variants, or by BREAKING UP all phones, including "iphone" into its 3g, 3gs, 4, 4s, CDMA and GSM variants like it does with android devices. Its a crock of crap. Yep, this chart is not even close to accurate. Which model of the Blackberry Curve is selling? PhoneArena, can you verify the acccuracy of this? Or are you just cutting and pasting the "news." 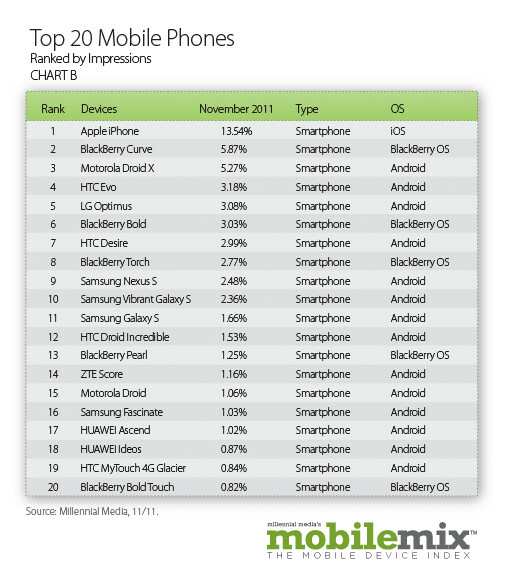 Notice how Huawei and ZTE handsets had 3 place holders in the 20! And as manufacturers, they are ranked in the 7th and 8th place, respectively. This goes to show more and more people are using android from Huawei and ZTE despite all the noise from android readers on this website. Just look at MetroPCS results or Cricket's new releases and it's clear, users want cheap android handsets. Why is it when we always see a chart of top mobile phones the iPhone is always listed as only one unit? Last time I check there a multiple versions of idevices and should have breakdowns of different models like the other manufactures. When it is posted this way it is misleading and creates an artificial leader. Can I trust this source for future reference? I just thought it was strange RIM growing. Is there a reason for RIM´s growth? where is samsung galaxy s 2? WHY IT'S NOT INCLUDED? Millenial can't be trusted!!! lets check back in a year. it will look drastically different. when you have all the major competitors competing for the best products at the lowest prices, best hardware, and improving os. apple has a huge fight it can't win. one vs all. Apple isn't for everyone. That is why Apple competes for its customers and does pretty well as evidienced by their gross profit margins and high customer satisfaction surveys. People tend to defend their overpriced purchases to the teeth to justify their spending as not just attaching their self worth to a brand. As the previous owner of a luxury brand (a car, BMW) I have no reservation making this statement. Once reality set in that while it was a good vehicle, it was still just another good car. There were other good vehicles out there to choose from. Until that time, I defended BMW's quality to the bitter end. Its a sad thing to live in a reality distortion field. More sad to cling to it once confronted with the truth. The most ardent Apple fans remind me of Cipher from the Matrix. The one that would rather be back in the goo believing the nutrient paste was a steak.